Lee Herold, DVM, DACVECC, explains retrobulbar cellulitis and how to diagnose, medically manage, and medicate these patients. 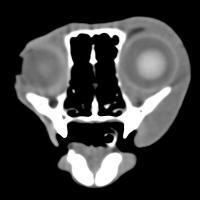 A 10 year old male neutered domestic shorthair feline presented with a 24 hour history of exophthalmia and chemosis OD. On exam the patient was normo-thermic with a temperature of 101.5 with a normal heart rate and respiratory rate. OD exam revealed moderate exophthalmia, chemosis, small amount serous to mucoid discharge and significantly decreased ability to retropulse the right eye compared with the left. No nasal discharge was appreciated. Sedated oropharyngeal examination revealed moderate dental calculi. No pocketing present along any teeth. No unstable teeth, draining tracts, swelling, etc. noted. The tonsils were both extruded from crypts, but not inflammed. There were no lingual or sublingual abnormalities. Arytenoids and larynx appeared normal. Hard palate palpated and appeared normally. There was very slightly increased soft tissue swelling noted caudal to the last premolar on the right compared to the left side, but no draining tract or inflammation noted. Needle aspiration caudal to the last molar yielded no material or fluid. With the working diagnosis of retro-orbital cellulitis, the region behind the last upper right molar was lanced and expanded with hemostats. No purulent or other material retrieved. No overt abnormalities or foreign objects were noted on exploration. The lance site was flushed with copious amounts of sterile saline. Convenia was administered. The patient represented three days after initial exam for continued exophthalmia and lethargy. A computed topography (CT) scan of the skull was performed and revealed edema in the retro-orbital region of the right eye, and exophthalmia but no mass lesions, no fluid pocketing or abscesses, no abnormalities of the teeth, and no foreign bodies. Recheck oral exam revealed a fluctuant swelling in the region behind the last molar at the previous site of lancing. The region was re-lanced. The patient was discharged with amoxicillin and buprenex. The patient recovered and no recurrence has been noted. The terms retro-orbital cellulitis and retro-bulbar abscess have been used interchangeably to describe a condition of dogs and cats where retro-orbital inflammation is present. 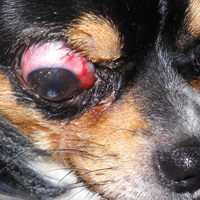 Dogs and cats with retro-orbital cellulitis present with exophthalmia that can be unilateral or bilateral. There is often pain on opening the jaw and fever. The onset of signs is usually acute, with signs occurring over a couple of days. The retro-orbital cellulitis can be initiated by migrating foreign material (grass awns and other plant material) but often the initiating cause of retro-orbital inflammation is undetermined. Though bacterial abscess is possible the cellulitis is often sterile. Exophthalmia should be differentiated from buphthalmia on physical exam. Other causes of exophthalmia including retro-orbital mass lesions, as well as tooth root abnormalities should be ruled out. Causes of jaw pain including myositis and temporal-mandibular joint (TMJ) abnormalities should be ruled out. There is no single confirmatory diagnostic test for retro-orbital cellulitis and diagnosis is made based on clinical suspicion and ruling out other causes of exophthalmia. Evaluation of a patient who is suspected of having retro-orbital cellulitis should start with the basics including a good history and physical examination. General bloodwork is recommended if the patient presents with fever and ocular diagnostics (fluoroscein stain, tonometry) may be indicated depending on the individual patient and initial examination findings. Imaging and oral examination are the most helpful diagnostics. Skull radiographs are not able to adequately evaluate the retro-orbital space but can rule out evidence of skull fractures. Dental radiographs can inform regarding the potential for tooth root abscess. Ocular ultrasound may be helpful to evaluate the retro-orbital tissues. Finally, CT scan or magnetic resonance imaging (MRI) are good imaging modalities and are able to evaluate for skull fractures, teeth abnormalities, the TMJ and the retro-orbital space. In retro-orbital cellulitis, oral exam may reveal a swelling, or draining tract located behind the last molar of the upper dental arcade and rarely a foreign body can be observed. Sometimes no lesions are seen on oral exam. Therapy for retro-orbital cellulitis is not universally agreed upon. In cases with very acute onset of bilateral exopthalmia, fever, and pain, I recommend heavily sedated oral examination or general anesthesia to lance and create an intra-oral drainage site. Culture and sensitivity, and lavage of the pocket, are indicated if purulent fluid or a draining tract is encountered. In many instances an abscess pocket or draining tract will not be encountered, but these patients still seem to improve more rapidly with lancing. Antibiotics are controversial as many of these are sterile lesions, but patients are typically discharged with an oral antibiotic. Pain medication is essential and I prefer non-steroidal anti-inflammatory drugs if there are no contraindications to their use. In cases in which there is only mild swelling, the patient is still eating, and does not have a fever medical management with control of pain +/- antibiotics and time may be sufficient for resolution. Exophthalmia if severe can predispose to lagopthalmia and exposure keratitis so a short course of ocular lubrication may be required to prevent corneal ulcers until exophthalmia is improved. The procedure is typically performed in lateral recumbancy; however, sternal recumbancy with an assistant holding the head up sometimes allows for better access to the region behind the maxillary molars in small or brachycephalic dogs. With the patient under either very heavy sedation or general anesethesia, open the mouth as widely as possible. Use a mouth gag to keep the mouth open when working if needed, or have an assistant hold the mouth open. Use the #10 or #15 scalpel blade to make a stab incision in the mucosa just caudal to the last maxillary molar. 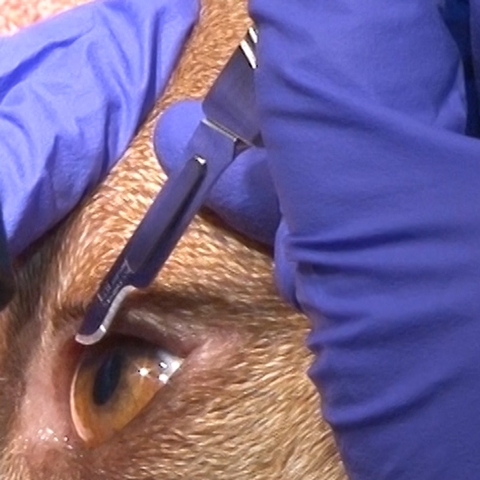 With the jaws of the hemostats (cat or small dog) or carmalts (medium or large dog) closed, insert the tip through the stab incision into the retro-orbital tissues. You can typically insert the instrument up to the level of the instrument hinge. With the hemostat or carmalt still in place, open the jaws of the instrument to widen the tract, and pull directly out of the stab incision with the jaws still open. If there is purulent material or a draining tract collect a culture by inserting a sterile culture swab into the lance site. If there is purulent material or a draining tract encountered you can lavage the pocket with sterile saline using an 18 gauge over the needle catheter (without stylet) attached to a syringe filled with sterile saline. If you are performing lavage it is advisable to protect the airway with intubation to prevent aspiration. If there are bilateral signs, lance the opposite side similarly.